Steve Hewins, president and CEO of HospitalityMaine, a hotel and restaurant association, said the Maine hospitality industry generates $6.5 billion in annual economic output, second only to health care in the state. One in two jobs in Maine is in hospitality, but hotels are finding it increasingly difficult to find staff because visa workers, which make up 10 percent of the workforce in high tourist season, cannot find lodging in the expensive apartment markets statewide. High housing prices, plus curbs placed on non-immigrant H-2B and J-1 visas by the federal government, are hampering the ability of hotels in Maine to expand, said Steve Hewins, president and CEO of HospitalityMaine, a hotel and restaurant association. 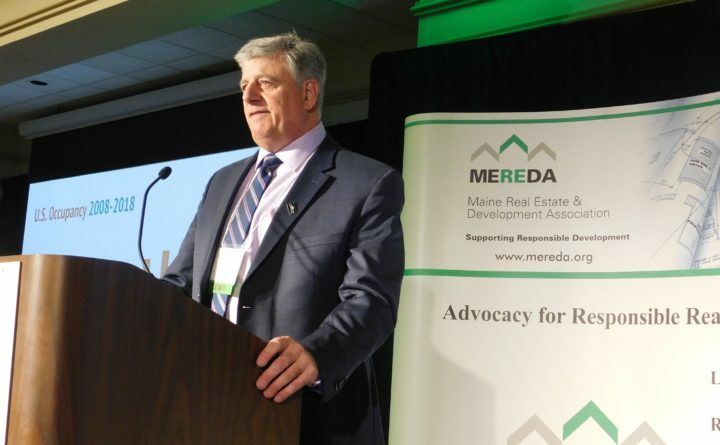 Hewins presented at the Maine Real Estate and Development Association, or MEREDA, conference on Jan. 17 in Portland. The Maine hospitality industry generates $6.5 billion in annual economic output, second only to health care in the state. It employs one out of two workers. In the high tourist season in the summer and early fall, some 10 percent of staff has H-2B or J-1 visas. “If you want a foreign temp for this summer, you had to apply by 12:01 a.m. on Jan. 1,” said Gary Vogel, president of MEREDA. “There were so many applicants they crashed the computer system at Homeland Security,” he said. Homeland Security administers the H-2B visa program. Hewins said the Homeland Security visa system was restarted a week ago. To cope with high housing costs for visa workers, hotels have started shuttle buses and even bought housing for them. “Some Mount Desert Island hotels are buying bed and breakfasts and turning them into dormitories for workers,” he said. The hotel occupancy rate in Maine from 2008 to 2018 averaged 60.75 percent, slightly behind the United States average of 66.16 percent. Maine lags the United States because of the seasonal nature of hospitality in the state, Hewins said. However, Maine beat the United States on the average daily revenue from rooms sold at $136.07 per room compared with $129.87 nationwide. In Bangor and the area north of Augusta, the occupancy rate was 61.9 percent in November 2018, up 2.6 percent compared with November 2017. The average daily room rate rose 1.4 percent over that year to $117.45. Hewins said that Bangor’s growth in hotel activity was spurred by the success of the Cross Center, Hollywood Casino and Darling’s Waterfront Pavilion. Colby College’s investment in Waterville sparked hotel activity in central Maine, while Augusta and Hallowell saw growth from the redevelopment of the riverfront. The midcoast occupancy rate was almost the same as Bangor’s at 61.6 percent, up 2.6 percent from November 2017 to November 2018. The average daily room rate rose 0.9 percent to $156.78. Camden’s and Rockland’s strong growth was buoyed by hotels and restaurants in the area. Ellsworth is growing as a regional hub and vacation destination. And Acadia National Park and cruise ships are boosting hotel activity in Bar Harbor. However, the seasonality of those areas continues to pose a struggle for businesses. Greater Portland and York County hoteliers and restaurateurs are benefiting from their proximity to Massachusetts, whose tourists are increasingly finding southern Maine a good alternative to Cape Cod to spend a weekend, Hewins said. “People are coming to Portland for the restaurants,” he said. Greater Portland, which had an influx of new hotels in the past several years, managed to keep them busy with a 70.8 percent occupancy rate in 2018, up 3.9 percent from 2017. The average daily room rate was up 2.6 percent to $154.03. That makes it one of the most expensive hotel markets in the nation, Hewins said, on par with Washington, D.C., and San Francisco in the high tourist season. York County, which is highly seasonal, saw 58.2 percent occupancy rates in 2018, up 1.2 percent from 2017. The average daily room rate was up 13.8 percent to $163.94. The area has significant workforce challenges to hire and house workers. “We’re seeing a continuing constriction of the workforce. It’s hard to expand,” said Allyson Cavaretta, general manager of the Meadowmere resort in Ogunquit. Besides staffing, another area in which hotel owners could be pinched is pending legislation, Hewins said. Only the state can tax hotels and restaurants now, with a 9 percent tax for lodging and 7 percent for meals. The option sales tax would allow communities to impose a tax to fund local services. Hewins worries that if the option sales tax goes into effect, it could make Maine less affordable to tourists. “Maine has already ramped up the lodging and restaurant taxes so high that if you layer on local option taxes, Maine will be expensive,” he said.